I had the privilege of reporting on the wonderful project launched by photographer Howard Parr and supported by Jaeger-LeCoultre to advance the fight against the “silent killer” of women, ovarian cancer. Howard is also an avid Jaeger-LeCoultre collector. As part of the observance of Ovarian Cancer Awareness Month, Jaeger-LeCoultre sponsored two Southern California receptions centered on Howard’s stirring photos of ovarian cancer survivors and benefitting the Ovarian Cancer National Alliance (OCNA). 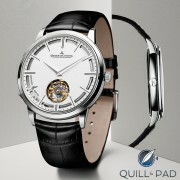 Thanks to Jaeger-LeCoultre, I had the opportunity to attend the event and a splendid evening it was. The first part of the festivities took place at the brand’s boutique in Costa Mesa, a relatively small, but very welcoming, space made even more special with the warm service and special boutique-only watches that make any visit a treat. Of course, as the crowd contained many JLC enthusiast collectors, we immediately got down to comparing watches. A glass of champagne in hand, it was fun to meet many of the attendees comprising a diverse crowd that brought together ovarian cancer survivors, representatives of the Ovarian Cancer National Alliance, and watch lovers. The evening also presented an opportunity for me to practice my photography. While my recent passion for photography is largely (and perhaps not too surprisingly) about the specialized world of watch macro photography, I’m starting to branch out into other realms. On this evening, I was pursuing a theme of capturing people from unexpected perspectives, including a “mirror image” of one of the folks in attendance. Of course, this also presented an opportunity to look at the beautiful watches on sale! I’m not sure whether this Master Compressor Extreme Lab 2 found a new home this night, but from the happy sounds and big smiles I think it just may have. The second half of the evening took place at a nearby restaurant, where we had an opportunity to view many of Howard’s photos and meet more of our fellow guests. I particularly enjoyed having the chance to meet the OCNA representatives and hear about their work; everyone was inspired by the presence of the ovarian cancer survivors in attendance that evening. One of the tragic reasons that awareness of ovarian cancer is so low is that the disease is so lethal; few women with ovarian cancer survive long enough to allow a large community of survivor-advocates to be built. My own wife’s journey with ovarian cancer lasted a scant two years, which, sadly, is very much the norm. On this evening, I met one woman who has been fighting ovarian cancer, and winning, for 18 years as well as other multi-year survivors. What a joy to see women who are beating the odds and working hard to help others do the same by building better early awareness of the disease and its subtle symptoms. After a brief welcome by boutique manager James Cueva, Howard Parr spoke eloquently about the project, his own experience with ovarian cancer as seen through the eyes of his late stepmother, and the inspiration he found in meeting the women he photographed. He found exactly the same thing that I did: women with ovarian cancer are focused on living, not dying. Perhaps because they know that the odds are long, they seek out the joy in each day. As Howard described what he had seen, every word rang absolutely true for me. There are several ways you can support the cause: prints of Howard’s individual photos will be for sale, and there will also be a book of his photos. We saw a prototype of the book that evening, and it is absolutely worthy of the topic and Howard’s work. As part of its support, Jaeger-LeCoultre has also made a limited number of special Teal Survivors watch straps available in both men’s and women’s versions. The ladies’ strap displays the teal color of ovarian cancer awareness around its outside surface; the men’s version has a teal lining and subtle teal keeper that will look absolutely fantastic on my Tribute to Reverso 1931. To make contributions: to the Ovarian Cancer National Alliance visit http://www.ovariancancer.org. For information on purchasing prints of Howard’s photos or the Teal Survivors book contact Howard Parr at [email protected]. Thanks for this report, Gary. It looks like a great evening for such an important cause. I admire Howard for his dedication to this cause. I also think it is wonderful that JLC is supporting this project. I have a lot of respect for JLC and am the proud owner of two of their watches – a Reverso being one of them. I I may have to look into getting the teal strap for my Reverso – it looks great! Thanks again and sorry for your loss. Thanks very much for your kind thoughts, John — I too commend both JLC and Howard for their efforts to increase ovarian cancer awareness, and hope that some day we will be talking not only about increased awareness, but about a cure! Howard had some design input into the men’s teal strap, and I think that the combination of teal interior and keeper with a mostly-black croc exterior is just right. Hope you will consider one!